The ambitious film will showcase locally produced special effects. Highly anticipated Hong Kong sci-fi action film Warriors of Future <明日戰記> has been grabbing viewer attention since its first trailer was released in 2018. Directed by up-and-coming director Ng Yuen Fai (吳炫輝), the film starring Louis Koo (古天樂), Sean Lau (劉青雲), Nick Cheung (張家輝), Carina Lau (劉嘉玲), Philip Keung (姜皓文) and Tse Kwan Ho (謝君豪) cost some $450 million HKD to make. 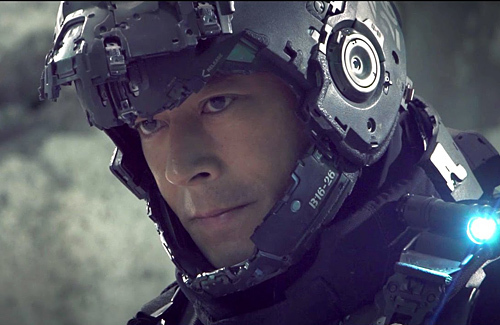 Its second trailer released recently showcased stunning Hong Kong-produced visual effects and revealed more of the plot, with Nick Cheung’s ambiguous character spiraling viewer anticipation. Set in the year 2025, earth has been thoroughly infiltrated by mysterious vine-like mutations aptly named “Pandora”, which have polluted mankind’s air and water supplies, thereby threatening basic survival. Against the setting of an abandoned megalopolis now overgrown with menacing vines, Louis Koo, part of the remaining rescue team, braves treacherous circumstances in a hi-tech artillery and navigates the ruins left of our world. Facing an attack by fearsome creatures from outer space who take the form of nimble robots, death and destruction stare him in the face. Along with Sean Lau and Philip Keung, the trio are hunted down by these menacing extraterrestrials, and forced to leap across a broken bridge in an intense scene. Philip Keung makes an impression with his character’s dreadlocks hairstyle and one-eyed look. Nick Cheung the Illicit Mastermind? Besides the three main leads, Carina Lau, Nick Cheung and Tse Kwan Ho play military officers who have planned an “Operation SkyNet” to defeat the malicious extraterrestrials. More ambiguous is Nick Cheung’s character. With the help of special make-up, he cuts an ominous figure and declares that he is “SkyNet” himself, evoking guesses that he might have deeper connections to the enemy instead. Didn’t you hear about recent Chinese film Wandering Earth? Nice looking trailer. The CGI actually doesn’t look computer animated fake. Good cast. Interested. Hope the script is good. It will need to make 2 billion rmb to make back the budget.